But, not all natural ingredients are great for dry skin. For example, so-called “essential oils” might sound as if they’re good for dry skin because they have “oil” in their name, but they also can contain numerous volatile fragrance components that can sensitise skin. As most people with dry skin know, aggravated skin makes dryness worse, not better. When searching for natural ingredients for dry skin, fragrance-free is always the best way to go. Non-fragrant plant oils, such as borage seed oil, argan oil, evening primrose oil, sunflower seed oil, and cranberry seed oil, are all amazing at soothing and revitalising dry skin. As a bonus, they all have antioxidant properties as well, which means they can defend skin against the environmental assaults that can cause dry skin in the first place. 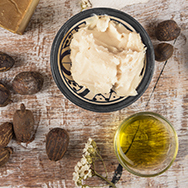 Last, but not least, there are a variety of skin-replenishing ingredients, such as ceramides, glycerin, cholesterol, and omega fatty acids, that can visibly strengthen and significantly soften dry skin so it looks revitalised rather than dull.